"It is what it is. That's her car out there and, well, that's her right there." Jeremy looks at the woman again. There's a few flies dipping in and out of the back of her skull. I feel a little uncomfortable. I wasn't really planning to lay it all out like this. "Well, I hate to say this but I killed her." Jeremy nods slowly. He's starting to take this in and I'm relieved. "Don't ask me why. Anything I say is just gonna sound ridiculous." "Things just got out of control." Bob Clark owns the Self Serve in Cashtown Corners. It's the only business there and Bob is the only resident. He's never been comfortable around other people. Until he starts to kill them. And murder, Bob soon discovers, is magic. People Live Still in Cashtown Corners is Bob's account of a tragedy we all thought was senseless. Tony Burgess's first novel, The Hellmouths of Bewdley received universal critical praise and hailed the arrival of Canada's "splatter punk Stephen King." He was shortlisted for the Trillium Award for his novel, Idaho Winter. He is also the author of the infamous zombie epic, Pontypool Changes Everything, which was named Best Book of 1998 by Now Magazine (made into the film Pontypool). His story collection, Fiction for Lovers won the Relit Prize for best Canadian short fiction. 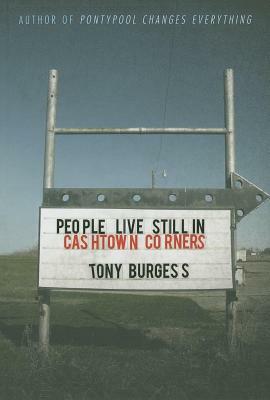 His previous novel with CZP, People Live Still in Cashtown Corners is currently being made into a film by Foresight Features and Bruce McDonald.